MUSECA is an arcade music video game released by Konami in 2015. The main concept of MUSECA is music game crossed with illustration. The MUSECA cabinet, part of Konami’s Bemani music simulation game series, has a foot pedal and five spinners, which can be pressed, held, or rotated, depending on the note type. Like SOUND VOLTEX (in the Bemani series), notes appear from the background in the centre of the screen and travel towards the judgement line. Notes are also color-coded depending on the input device they are associated with (blue for the top three spinners, yellow for the bottom two spinners, and white/red for the foot pedal). Note types are the following: •	Hit Object: a normal, diamond-shaped note that can be hit by pressing the spinner. •	Charge Object: a long note that requires the spinner to be held down. •	Spin Object: a cone-like note that requires the spinner to be rotated. The spinner can be rotated in either direction. •	Storm Object: similar to Spin Objects, but they must be rotated with more force. •	Kick Object: a large, wide note that requires the foot pedal to be pressed and held. •	Directional Spin Object: A Spin Object that requires the spinner to be rotated in a specific direction. The direction in which the spinner must be rotated is indicated by an arrow above the note. When holding down Charge Objects or Kick Objects, a "CHARGE" percentage indicator is shown. The second of two judge ranks for the Object is based on how high the note was charged when the Object ends: •	100%: CRITICAL •	20%-99%: NEAR •	0-19%: ERROR The Object needs to be held entirely to receive 100% CHARGE. Additionally, letting go of the Object will not break the player's CONNECT. It will simply stop increasing CHARGE until the Object is pressed again. The gameplay interface itself is very similar to SOUND VOLTEX. There are three difficulties: Green, Orange and Red. The difficulty scale goes from 1 to 15. Object judge rank names are also the same as SOUND VOLTEX: CRITICAL, NEAR, and ERROR. Combo in this game is referred to as CONNECT, and a full combo is referred to as CONNECT ALL. At the start of or during a song, some gameplay options can be changed: lane shape (curve or no curve, W or flat) and speed modifier (independent of song BPM). More options can be accessed in the song select menu by holding the foot pedal. In 1+1/2, scores were given a ceiling cap of one million. Unlike other games that typically use alphanumerical letters to grade scores, MUSECA uses kanji for its score grading. One of MUSECA's most notable aspects are the illustrations named Grafica. In the earlier days of MUSECA's lifespan, the player had to clear STORY, one of MUSECA's unlocking systems, to access the Grafica system. Most Grafica could've been obtained by purchasing them with one of MUSECA's currencies, COLORIS, while others were obtained via-STORY. During gameplay, a Grafica could give the player GIFTs, which are in-game bonuses that are auto-triggered at some points of the charts, slightly modifying the chart lane's judgment line. GIFTs included Life Support, Score Gain, Play Risk, and Item Collect. With the reworking of the game in MUSECA 1+1/2, the GIFT mechanic has been removed and Grafica have mostly been relegated to primarily visual appeal during gameplay. The game is now split into two modes, one focusing on the music game aspect and another focusing on the Grafica aspect. In the latter mode, players can obtain Grafica by unlocking them through Release Missions. At the beginning of a Release Mission, a canvas sits in the background. The player is tasked with "sketching" the Grafica by playing the given song with the aid of other Grafica. The mission is marked complete if the player manages to finish the image of the Grafica before the song ends. However, if the player fails to complete the Grafica within the allotted time, they will have to start from scratch. A levelling system called MEDEL was also introduced in 1+1/2. Grafica earn experience points as they are used and their draw power and potency during Release Missions are increased as they gain levels. A Grafica's MEDEL cap is dependent on the difficulty cleared for the Release Mission they're attached to: •	GREEN: up to MEDEL 8 •	ORANGE: up to MEDEL 9 •	RED: up to MEDEL 10 •	PREMIUM: up to MEDEL 12 Some Grafica characters have their own voices that play when they're triggered in-game. In addition to original song contests, Grafica design contests are held as well. 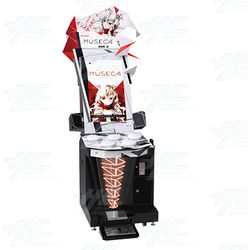 The MUSECA cabinet, part of Konami’s Bemani music simulation game series, has a foot pedal and five spinners, which can be pressed, held, or rotated, depending on the note type. Like SOUND VOLTEX (in the Bemani series), notes appear from the background in the centre of the screen and travel towards the judgement line. Notes are also color-coded depending on the input device they are associated with (blue for the top three spinners, yellow for the bottom two spinners, and white/red for the foot pedal). •	Hit Object: a normal, diamond-shaped note that can be hit by pressing the spinner. •	Charge Object: a long note that requires the spinner to be held down. •	Spin Object: a cone-like note that requires the spinner to be rotated. The spinner can be rotated in either direction. •	Storm Object: similar to Spin Objects, but they must be rotated with more force. •	Kick Object: a large, wide note that requires the foot pedal to be pressed and held. •	Directional Spin Object: A Spin Object that requires the spinner to be rotated in a specific direction. The direction in which the spinner must be rotated is indicated by an arrow above the note. When holding down Charge Objects or Kick Objects, a "CHARGE" percentage indicator is shown. The Object needs to be held entirely to receive 100% CHARGE. Additionally, letting go of the Object will not break the player's CONNECT. It will simply stop increasing CHARGE until the Object is pressed again. The gameplay interface itself is very similar to SOUND VOLTEX. There are three difficulties: Green, Orange and Red. The difficulty scale goes from 1 to 15. Object judge rank names are also the same as SOUND VOLTEX: CRITICAL, NEAR, and ERROR. Combo in this game is referred to as CONNECT, and a full combo is referred to as CONNECT ALL. At the start of or during a song, some gameplay options can be changed: lane shape (curve or no curve, W or flat) and speed modifier (independent of song BPM). More options can be accessed in the song select menu by holding the foot pedal. In 1+1/2, scores were given a ceiling cap of one million. Unlike other games that typically use alphanumerical letters to grade scores, MUSECA uses kanji for its score grading. One of MUSECA's most notable aspects are the illustrations named Grafica. In the earlier days of MUSECA's lifespan, the player had to clear STORY, one of MUSECA's unlocking systems, to access the Grafica system. Most Grafica could've been obtained by purchasing them with one of MUSECA's currencies, COLORIS, while others were obtained via-STORY. During gameplay, a Grafica could give the player GIFTs, which are in-game bonuses that are auto-triggered at some points of the charts, slightly modifying the chart lane's judgment line. GIFTs included Life Support, Score Gain, Play Risk, and Item Collect. With the reworking of the game in MUSECA 1+1/2, the GIFT mechanic has been removed and Grafica have mostly been relegated to primarily visual appeal during gameplay. The game is now split into two modes, one focusing on the music game aspect and another focusing on the Grafica aspect. In the latter mode, players can obtain Grafica by unlocking them through Release Missions. At the beginning of a Release Mission, a canvas sits in the background. The player is tasked with "sketching" the Grafica by playing the given song with the aid of other Grafica. The mission is marked complete if the player manages to finish the image of the Grafica before the song ends. However, if the player fails to complete the Grafica within the allotted time, they will have to start from scratch. A levelling system called MEDEL was also introduced in 1+1/2. Grafica earn experience points as they are used and their draw power and potency during Release Missions are increased as they gain levels. Some Grafica characters have their own voices that play when they're triggered in-game. In addition to original song contests, Grafica design contests are held as well.